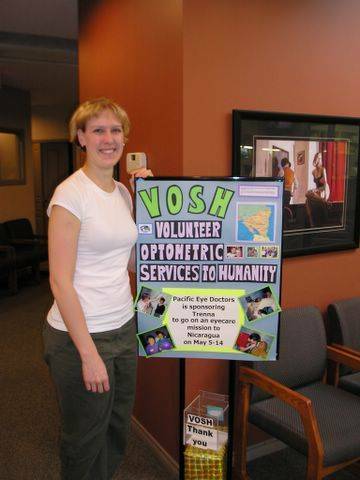 Since 2006, Pacific eyeDoctors has sponsored staff members to participate in yearly VOSH Third World Eye Care Missions. Our staff members work hand in hand with doctors and other volunteers at various clinics to provide eye examinations and glasses to adults and children in need. Photos from these amazing trips can be viewed here. We collect donated eyeglasses and sunglasses on an ongoing basis. Please feel free to stop by the office and drop off your unwanted eyeglasses and sunglasses, and give the gift of sight to someone in need. Thank you all for your attendance and generous contributions to the home building project. When all the funds were added up, the winnings for the 50/50 handed out and the cost for the dinners removed, we made a profit of $2600! Add on the personal donations that we have received over the past year and we have exceeded our goal of $3500 needed to cover the cost of the house and beds/mattresses for the Sanchez-Hernandez family. We will also be buying them a good supply of non-perishable staple foods. The crew is heading down next month to build another 4 homes, so we are having them check out the price for paver stones and hope that they will be available. If possible, we plan to put in a ground level patio at the back door so they have a clean dry area to use. When the rains come, the houses are surrounded by mud. This weekend marks the 14th anniversary of Hurricane Mitch which displaced 350,000 people and killed thousands more due to torrential rains and mudslides. Most of the damage was done in the area that we do the mission work. The end result was people squatting where ever they could to find a place to live. Hence the “refugee” camp was formed. In March, Pacific Eye Doctors helped sponsor Judi to participate in a Third World Eyecare Mission. 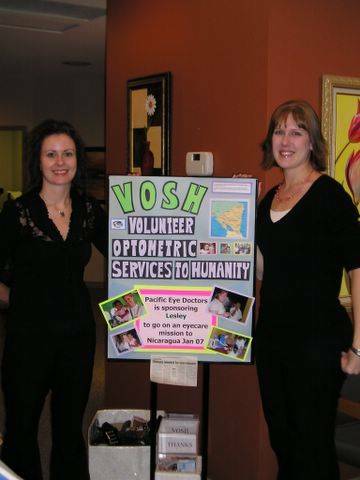 She joined Trenna and traveled to Nicaragua with VOSH Florida (Volunteer Optometric Services to Humanity). They traveled to the West Coast, visiting the same cities as the 2006 and 2008 missions. Once again, the vision team was accompanied by a construction team who built two homes for families in the Refugee Camp. This time there was only one Optometrist in the group (normally there are 2-3), and he saw 100 patients per day. These were long clinic days, but we were able to successfully see all the patients. In January, Pacific eyeDoctors helped sponsor Lesley to participate in a Third World Eyecare Mission. She joined Trenna and traveled to Nicaragua with VOSH Florida (Volunteer Optometric Services to Humanity). We visited Ocotal, which is 20 mins from the Honduras boarder in Northern Nicaragua. We were able to see over 900 patients in the 4 clinic days. Thank you to all of you who donated their old eyeglasses. You personally helped give the gift of sight to someone in need. Vision is something we take for granted every day. Imagine not being able to see for a good portion of your life. Giving some a simple pair of glasses was the highlight of their life. This year I had an opportunity to participate in a life-changing experience. 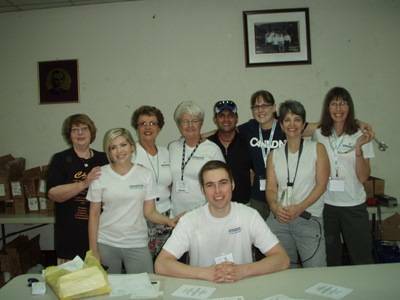 I ventured to Nicaragua with a group from Florida to join VOSH (Volunteer Optometric Services to Humanity) on a Third World Eyecare Mission. I was able to give the gift of sight to many people who have never experienced good vision. That was an amazing feeling to take part in helping people who are a lot less fortunate than you. I would like to take the opportunity to thank the community for their generous donations of used glasses that were used as a part of a Third World Eye Care Mission to Nicaragua this May. The number of glasses that came pouring in exceeded any amount we had hoped for. The eyeglass collection is an ongoing project at Pacific eyeDoctors so if you still have used glasses it is not too late to donate them. Sunglasses, both regular and prescription are in high demand. VOSH is dependant on the donation of used glasses to continue missions like this one all over the world. Thank you, Dr. Judy Schnarr, for giving me the opportunity to participate in this life-changing experience. I look forward to participating in other eyecare missions through VOSH in the future.